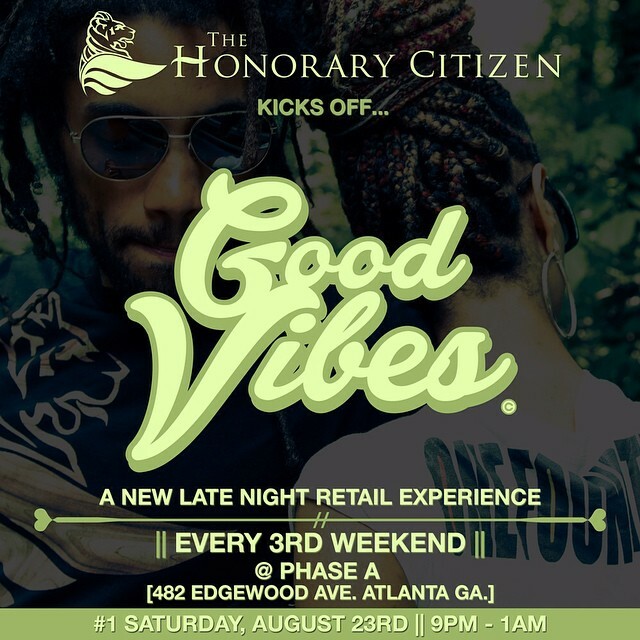 Small batch clothing brand “The Honorary Citizen” of Atlanta, GA is launching their first late night Pop Up retail shop experience, “Good Vibes”. The shop will operate every 3rd weekend of the month starting Saturday, August 23rd 9pm – 1am and August 24th 5pm.- 10pm at Phase A, 482 Edgewood Ave. Atlanta, GA 30312. THC began in 2004 making graphic tees. In 2009 the brand began its journey into cut and sew with the mission to make high concept casual wear. Since then, they have built a collection that includes nicer feeling, better fitting, comfortable threads in unique and bright colors. All pieces are made in a socially responsible way, with fair wages, in the USA. During the Good Vibes late night pop up shop, costumers will be able to shop an exclusive variety of cut and sew garments, vintage tees and accessories from other indie designer labels. Good Vibes will be an unique shopping experience that will reoccur monthly and will include, special guest DJ’s, gaming and live entertainment. The Monthly Pop Up Shop with The Honorary Citizen is a unique late night retail experience on Edgewood that will feature exclusive items and special pricing for those that want to stay one of a kind. “Good Vibes is our metaphor for first fruits. Before we share our work with the world or even put it online, we want to offer it to our community.” says Khatoum Tut, representative for THC. THC is offering great entertainment, Music, Gaming, and an exclusive shopping experience.